I had a really enjoyable dialogue with a TinkerTry site visitor recently, and I've obtained Mike's permission to go ahead and publish this, with some of my minor typos cleaned-up, and formatted so you can read from top to bottom. It's all about processor and storage choices when building your own virtualization lab, such as my vZilla build. Most of what we discuss below applies to both VMware ESXi or Microsoft Hyper-V. I plan to eventually nest Hyper-V under ESXi, but first, I need to take care of moving off my old Home Server (for backups) to the new Home Server 2011 version, described at TinkerTry.com/whywss2008r2essentials. With the recent release of vSphere Hypervisor ESXi 5.0 Driver Rollup 1 downloaded from here, the entire LSI driver install step outlined here is no longer needed, with native 9265-8i driver support now built-in. So I'm ready to proceed with actually building my final configuration, after months of preparation, testing, watt-burn-measurements, rehearsals, and hundreds of RAID and SSD speed tests. Here's the draft outline of the build procedure I cooked up. which is just, well, so awesome, making all the effort to blog about this so very very worthwhile for me, and hopefully for my valued site visitors! Enough build-up, please read the email below, then consider taking a moment to let us all know what you think, site sign-up not required! Hey there, I'm tying to build a home vSphere lab, using the Intel i7 2600 processor to run ESXI 5. I was thinking about getting the low profile 2600s. Would you recommend the 2600 over the 2600s? Does that processor support vmotion/ft/vmdirectpath? I love questions like this! Mike, any chance you'd let me put this conversation up on tinkertry.com (without your email address, and just your name "Mike", of course)? Anyhow, either way is fine, always glad to hear from a reader. the row to look at is "Intel® Virtualization Technology for Directed I/O (VT-d)", and both the 2600 and 2600k say Yes. 2) Same Intel site shows 95W for 2600K and 2600, and 65W for the 2600S, so a 30 watt difference. It's true, you'll save some electricity. So for my situation, assuming that at near idle workload, the difference in the watt burn comparing the 2 CPUs would probably be about 30 watts (not at all sure this assumption is valid). This comes out to $47 per year extra, or $188.68 for 4 years non-stop running. For me, my focus was on possibly testing advanced virtualization technologies and I figured I'd go with the 2600, just in case I wound up caring about vPro for some reason, someday. I hope this helps your decision a little! Mike, I took a stab at answering the vmdirectpath part of your question, but I forgot about vmotion and ft.
Well, looking at that Intel comparison, I cannot imagine why those features would be different between the 2600 and 2600S, I just don't really know for sure. Moreover, I don't currently have a second ESXi host to properly test those features. You can surely post my question. I have no problem with that at all. Thanks for the detailed reply. I guess the 2600k would be good for overclocking, but I'm not planning on doing that. I think I'll stick with the 2600 like you. I do not plan to run it 24/7....Basically a few hours a day, maybe 8 hours at best. I was planning on buying 2 of these shuttle PCs, but I'm going to start out with one.. I guess I'm actually more concerned with vmotion/FT, then I am with DirectPath...all features would be great though. I'm trying to get my VCP, also will use it to learn advance vmware topic and VMware View. I also plan to purchase a NAS. I'm considering the Synology DS712+. I was looking for the DS411+, but all I can seem to find is DS411. Pricey stuff, but I don't want to put local drives in my shuttle PC....I'd rather create LUNS and connect via iSCSI. Do you have a preference for these type of devices? Great, thank you for the permission! and used to do NFS tests with vMotion with it. I realized that I don’t have the frequent need to vMotion, and was more concerned with fast performance, so I’m trying this local extremely fast storage route, as I begin to prepare for VCP 5.0 next year. 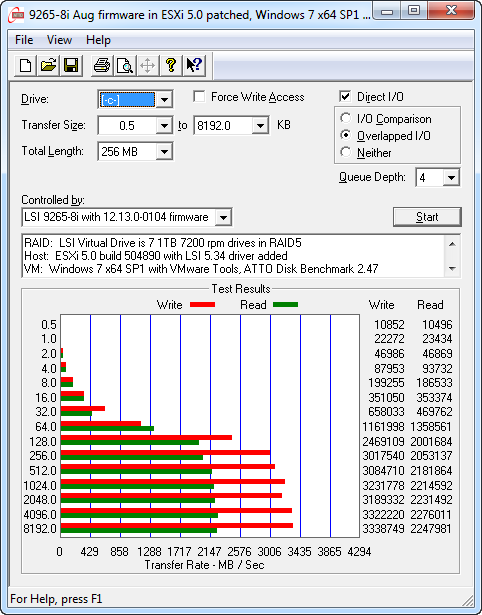 Nice thing about ESXi 5 is the very easy migration from one storage pool to another (say from the big RAID0 to the motherboard-SATA3-port-attached SSD, for example), to do quick comparative tests with ease, without even having to reboot the VM. It also helps that I had a group of hard drives for this project, ready to be reused, and an interest in using fast RAID controllers with caching via SSD, which I liked learning about. But that’s just me, just my little test, for my specific needs. It’s not intended to say it’s a better way or anything. Great talking to you, stay in touch! So this seems to mean the only significant difference between the 2600 and 2600S is the 2600S is underclocked (runs .6GHz slower), thus, it saves some power. Cache and all other specs that matter are identical. There is a fall in performance of around 12% compared to the 2600K, which is mostly visible with programmes that usually make the most of multiple-core processors. That's logical because the Turbo mode is less useful and the processor has to fall back on its basic clock speed, which is lower here. but here's one place that says in stock at $306 USB here. What do the rest of you think about CPU choices? How about storage? Have you found a NAS Solution with incredible speed, and a decent price? This speed should improve even more, once I can use SSD Caching with CacheCade 2.0 coming to my LSI 9265-8I RAID adapter early next year, which won't require any operating system drivers or software. This is in contrast to Intel Smart Response Technology, which works great at a much lower price point as I talked about at TinkerTry.com/gzilla, but is currently Windows-only.